Okay, so there’s maple syrup in this recipe, but roasted butternut squash is sweet enough that you can totally skip it if you want. With cinnamon, vanilla and nutmeg, this is reminiscent of pumpkin pie. A gloriously cinnamon-y parfait that is so filling you could eat this for dinner! The inspiration behind using butternut squash today came from Instagram star and cookbook author, Lina Saber of RadiantPlantLife . She is conducting a television show competition featured on Instagram and I am so glad she does! She tosses out ingredients, and competitors create. 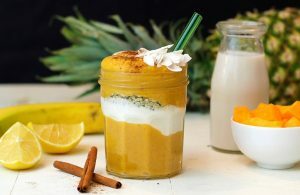 I came up with a parfait smoothie using this fantastic vegetable, Butternut squash, and the result is a spicy yet sweet smoothie that is full of nutrients and fiber, perfect for a seasonal drink. Enjoy! Slice the butternut squash in half, scoop out seeds, chop and roast on a cookie sheet (without oil) for 30 minutes at 350 degrees. Cool, then toss in a blender with other ingredients! Top with cinnamon and yogurt and serve chilled! So delicious!